Heading out for a party this weekend and in need of a clutch to go with your new outfit? If you find yourself tight for cash that does not mean you can get a new purse for your night out. 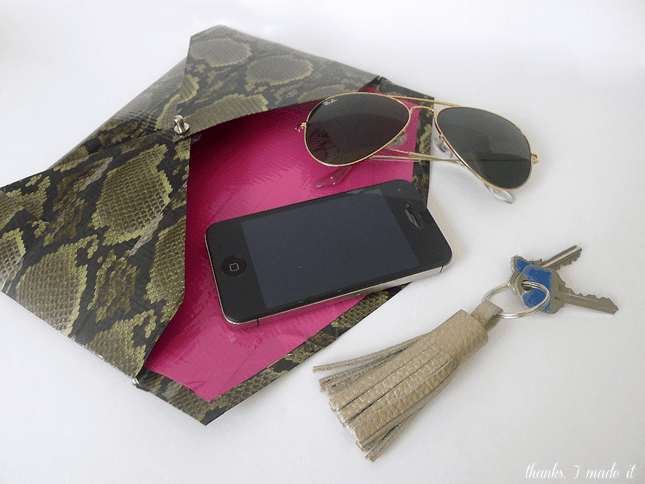 DIY your own clutch, just like Thanks, I Made It,​ using poster board and either a solid color or patterned duct tape to create a very inexpensive clutch. Add some color to some of your bland storage boxes by covering them with two colors of duct tape, one on the base and a contrasting color on the lid, to quickly change the boxes color without all the mess of paint. See how to make your own duct tape wooden box at Honey We're Home. Lampshades are often limited to plain shades of white and ivory, so if you are looking to have your lamp become a bolder accent in your room you can DIY your own lamp shade using duct tape. Using two 10 inch embroidery hoops for the top and base of the lamp shade use strips of colored duct tape to complete the middle area of the shade as done by High On DIY. Add a metallic finish to your candles to create a glamorous table setting perfect for the metallic accent trend that is holding strong. Silver or gold candles would be the perfection addition to your table setting or around your home. Before you burn your candles make sure to read some of the DIY duct tape candle tips at Something Turquoise. DIY Duct Tape Metallic Candles from Something Turquoise. Craft your own black and white chevron purse out of paper and cover it with black and white duct tape as done by the creative ​Sarah Hearts to create an eye-catching chevron pattern. Add a studded bracelet to go with your favorite jean outfit for the perfect casual and slightly edgy outfit. Using a strip of duct tape folded over and over to create a bracelet you can enhance it by punching studs through the folded duct tape to create a very inexpensive piece of jewelry. To learn how to form a bracelet out of duct tape visit Thanks, I Made It. Switch up the look of your cell phone case by giving it bold stripes for a fun geometric design. Best of all this colorful DIY by I Spy DIY can easily be done between classes or on a coffee break, and can easily be removed and redesigned by adding new strips of tape. While you are covering your phone case make go ahead and cover your phone charger too so it will match. This way you will never be able to mix up your phone charger with someone else's charger. Your office and school supplies do not need to dull, dress them up by taking items like your clipboard or pens and wrapping them up in strips of duct tape just like That's What She Said. did to her office supplies. Cheryl created a set of penguin clipboard and pen using one of the fun patterned designs of duct tape available. Customize a thrift store tray by covering it up as with duct tape as done by Honey We're Home to give it a new look. Or copy Megan's genius idea and use a box lid such as a shoe box for the base and cover it with snakeskin patterned duct tape to create an edgy accent tray to gather odds and ends.